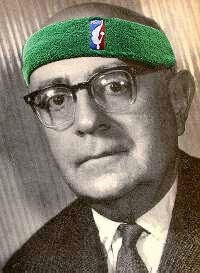 Negative Dunkalectics: ND Classique: The Age-Old Question - Why was Brad Lohaus a player in the original NBA Jam? ND Classique: The Age-Old Question - Why was Brad Lohaus a player in the original NBA Jam? Apologies for the hyperbolic title, but I like to convince myself that at least one other person cares about the same minutia I do. When the subject of NBA Jam comes up, most people want to talk about the catch phrases (He's heating up!) or the fact that you couldn't play as Michael Jordan but could play as Bill (or George) Clinton. With the newest version of the classic arcade game coming out in its various console forms a few months ago, I think it's as good a time as any to share my fixation with Brad Lohaus. The fact is that the 1992-93 Milwaukee Bucks weren't the most memorable NBA team. Outside of the greater Sheboygan area, you didn't find too many people at the arcade dying to take the controls of Blue Edwards. But the question remains....Brad Lohaus? Of the "Original 54" players included in NBA Jam, his lifetime PPG (5.9) was the lowest. The next lowest was Stacey Augmon at 8.0, though the Plastic Man was in the prime of his career in 92-93, averaging 14 PPG. A quick look at the 92-93 Bucks roster also shows that there were several players more worthy of NBA Jam status than Lohaus. One late night during an extended stretch of joblessness, I decided to do some investigative research and e-mail Mr. Lohaus himself to see if he had any insight. After all, this is a guy who owned a bar with an NBA Jam arcade machine wherein he would play the game as himself and refuse to take on any challengers. He was also once arrested for failing to deliver $2000 worth of fishing rods sold on ebay, but that's neither here nor there. Hello, I happened to stumble upon your contact information and had a question for you regarding your inclusion in NBA Jam. As a big fan of the game, I've always wondered why they selected you to represent the Bucks. No offense meant, as you were a very solid player, but there were a few Bucks such as Eric Murdock, Frank Brickowski, and Todd Day who had better statistics, and NBA Jam usually included the top 2 players on each team. Do you have any insight into this? Also, did you play the game a lot as yourself? Did you ever break the backboard? Haha. Thanks, and good luck with your new career. Much to my surprise, I never got a response. You would think he would at least appreciate that someone remembers his place in video game history, but apparently not. All I'm left with is more questions. Did he pay someone off? Was this his prize for winning a Mortal Kombat tournament? Was there a racial quota to fill? Since I have nothing else to add to this subject other than more baseless speculation, I'll instead give a shout out to probably the most obscure member of "The Original 54", Mike Iuzzolino: a 5'10" Italian-American who played 2 years in the NBA, on one of the worst teams in history, the 1992-93 Dallas Mavericks. He was quickly substituted for Jimmy Jackson once NBA Jam hit the home consoles, and was never heard from again. But in case Mike is reading this, why were you a player in the original NBA Jam?